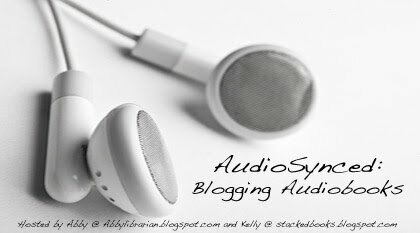 Abby the Librarian: Don't forget AudioSynced..! If you've reviewed or discussed audiobooks on your blog this month, don't forget to give me a link to your post so I can include it in the roundup on April 1 (no foolin')! Feel free to leave a comment to this post or send me an email at abbylibrarian @ gmail.com. Also, feel free to leave your post in the comments of Thursday's roundup. Get the link to me by any means and I'll include it! If you don't have an audiobook post this month, never fear! Kelly of Stacked will be back with another roundup on May 1. Hi Abby ... it's all audiobooks all the time at Reading with My Ears (http://readingwithmyears.blogspot.com/). March also brought an audio fangirl bonus: A cheerful, friendly phone call from narrator Dion Graham, reader of my beloved Peace, Locomotion and We Are the Ship, as well as a whole raft of other great books!